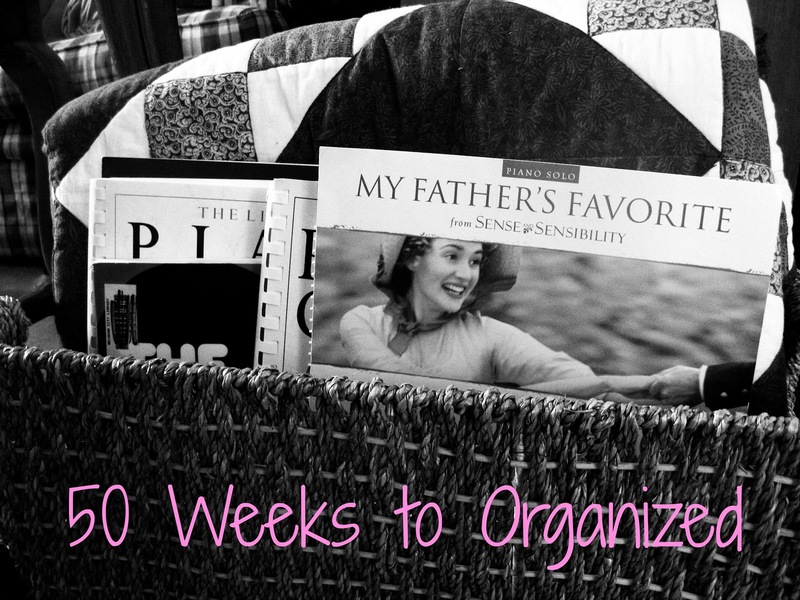 I’m having a really hard time keeping up with this whole “50 Weeks to Organized” project. No, this is not an “I’m going to give up” post–this is an “I’m finding this whole process a lot harder than I thought it would be and a lot of the time, I wonder if it’s really ‘working’ yet” kind of post. I’ve mentioned so many times before on the blog that I have SUCH a hard time with keeping a tidy apartment. I guess by itself that might not be such a big problem, but the truth also is that I have this obsessive desire for things to be organized all the time. I know. I’ve been trying to figure it out for years. I guess what I’m trying to say is that I just wanted to be real for a moment here, just in case you were thinking that my little organization journey was picture-perfect all the time. The truth is, it’s not. It’s HARD. And I’ve REALLY got to work on maintaining the changes that I’ve already made thus far this year. So, in case you were wondering if I was a real live human being, there’s your answer. Since I’m being all honest with you here, I’ll let you in on a secret: I did last week’s organizational project today, about 15 minutes ago (it is currently 7:27 P.M). Obviously I still have to work on my procrastination habit, but I think I’ll save that for another year. 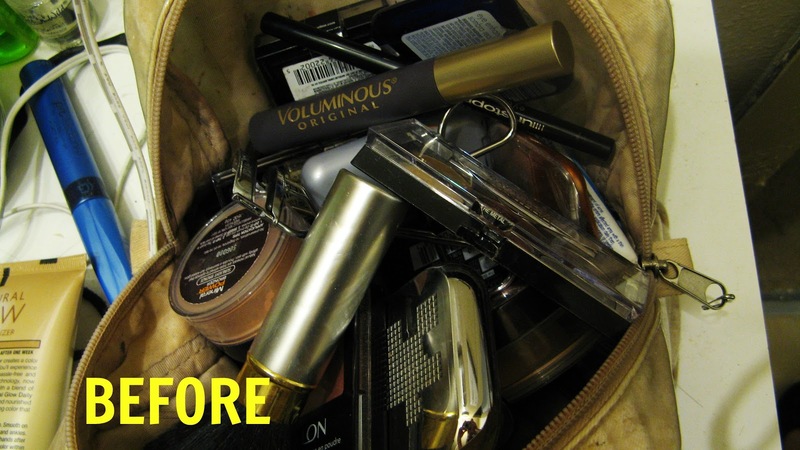 Anyway, my makeup bag has been desperately in need of a clean for, well, about the entire time I’ve had it. 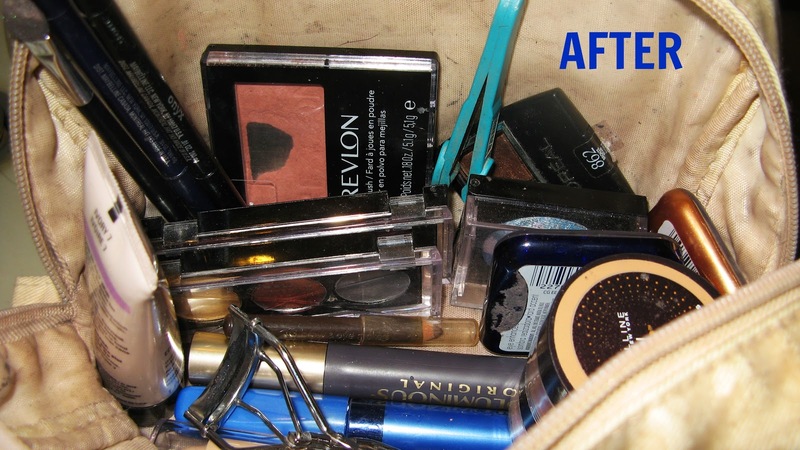 As I started going through it, I found makeup items I’d bought over five YEARS ago. Heck, there were some things in there I think I bought during my first year of college, all the way back in 2005. Most of that stuff was pretty easy to toss (especially since the really old things were coated in a layer of grime and eyeshadow powder), but some of the items were surpisingly difficult, even though I rarely (if ever) use them. *Even though I always want to “try out” different eyeliner colors, I always go back to black, and the other colors just end up sitting there, collecting grime. I either need to really change my makeup look or just never buy any liner but black. *A few months ago, I bought an “airbrush” powder that I hated, which resulted in me going powder-less most days. And you know what? I think I like it better that way, especially since I started using Mary Kay’s matte foundation, which has a finish like a powder anyway. *Even though I know I should have tossed my waterproof mascara (because it’s about a year old), I couldn’t bring myself to do it on account of the 3-4 times a year that I go swimming and actually want to wear makeup for whatever reason. Guess I’ll have to make a goal to get over my vanity another week. *Even though I am in desperate need of a makeover (makeup, hair, the works), I am putting all improvements on my outward appearance on hold until this first year of teaching is over. I just can’t handle a new routine at 5:30 in the morning–pretty much I’m stuck with doing what I’ve always done since I’m on autopilot at that unreasonable hour. The story of my filing cabinet is that I got it over ten years ago, filed everything away I could think of (cuz I was so excited and all), and then in the years since then, I’ve just randomly started shoving things into unmarked folders wherever they would fit. In addition, I haven’t gone through the whole cabinet in years and years. *Go through my current filing system and toss everything that’s unnecessary or outdated. Shred all personal documents that no longer need to be saved. *Gather up any loose papers lying around the house (make sure to check EVERY room! ), and start sorting them into piles based on similar content. *Assess my current filing system: what tabs are missing? What tabs can be updated or changed? Make a list of all file topics, and avoid creating any folder titled “miscellaneous.” Create new folders or tabs with the new titles. *File all papers in their appropriate categories. *Consider making a master list of the more important file categories, along with a list of their contents. This will make it much easier to find important documents in a hurry. *Set up a “to-file” bin, and file away all the papers in it at least once a month. Do you have a filing cabinet? If not, do you have a different way of organizing your papers? I’m definitely open to suggestions, so fire away!